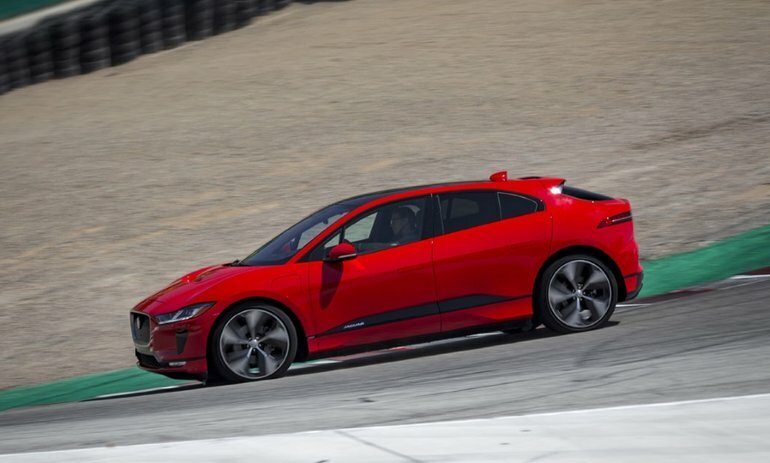 The 2019 Jaguar I-PACE crossover SUV has just set a record for “showroom stock” production electric vehicles lapping Monterey, California’s renowned Laguna Seca racecourse, just before going on display at the 2018 Rolex Monterey Motorsports Reunion and the Pebble Beach Concours d’Elegance. American racing driver and Motor Trend journalist Randy Pobst did the honours, and despite losing the back end and scrubbing off speed through turn 3 managed an impressive 1 minute and 48.18 seconds (1:48.18). The I-PACE driven was in top-line limited First Edition trim, which means it was filled with more features than lesser S, SE, or HSE trims and therefore heavier, while it was also bone stock, with “no modifications whatsoever” made to help it accelerate faster, handle better or stop quicker. A Tesla Model S P100D had previously claimed the fastest production EV record around Laguna Seca, completing a lap in 1 minute and 47.62 seconds, but it reportedly received upgrades to its brakes, so therefore wasn’t to factory specifications like the I-PACE First Edition shown in the in-car video verifying his record (see video footage below). The entertaining two-minute clip shows just how potent the new I-PACE is, and just how much fun. Pobst even chuckles while the I-PACE drops downward into the famed corkscrew (turn 8), an experience that often leaves the uninitiated breathless and hanging on for dear life as the car plunges from an elevation of 283 to 265 metres within seconds (it’s the equivalent of a 5½ storey drop in just 137 m of track distance), the rollercoaster ride continuing on its steep decline past turn 9 (250 m), turn 10 (236.5 m), and turn 11 (233.5 m) before exiting onto the finish straight. Pobst, 61, has more than 90 pro wins under his belt, and most notably was the 2003, 2007, 2008, and 2010 SCCA World Challenge GT championship winner, the 1996 North American Touring Car Championship title-holder, and the 2005, 2006 and 2007 SCCA World Challenge TC vice-champion. Additionally in 2001 and 2006, the Dayton, Ohio native was a two-time class winner of the 24 Hours of Daytona. The new 2019 I-PACE uses a 90-kWh pouch-cell lithium-ion battery pack plus a permanent magnet electric motor at each axle for standard all-wheel drive, the combination good for 394 horsepower and 512 pound-feet of torque, which means it can sprint from standstill to 100 km/h in just 4.8 seconds before maxing out at a top speed of 200 km/h. On a more practical note, the new 2019 I-PACE has an EV range of 386 km, which should provide most users with multiple days between charges, plus the ability to travel short distances or extend road trips longer when recharging stations can be found along the way. The I-PACE battery pack only needs 40 minutes to fill from a fully drained state to 80-percent capacity when hooked up to a 100-kW DC quick charger, while a regular 240-volt Level 2 home charger will require about 10 hours to achieve the same results, or slightly less than 13 hours (12.9) to fully top it up. To draw more attention to I-PACE track prowess, Jaguar has put together the “world’s first all-electric production based international race series” dubbed Jaguar I-PACE eTrophy race series starting later this year. It will smartly support the fifth season of the ABB FIA Formula E championship set to kick off in Ad Diriyah, Saudi Arabia on December 15, a series that Jaguar has contested since inception (out of eleven entrants the Panasonic Jaguar Racing team was runner up at the close of the 2017/2018 season). Sports car and open-wheel racer Katherine Legge (UK) has been confirmed as the team’s first driver, showing the series is already attracting high-calibre talent. 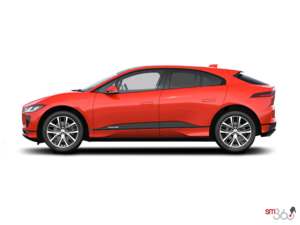 Deliveries of the 2019 Jaguar I-PACE begin later this year, with pricing starting from $86,500 before provincial government incentive programs in Quebec and BC (Ontario no longer offers plug-in rebates). A fully loaded First Edition, like the one raced around Laguna Seca, will set you back $103,500 plus freight and fees. To find out more about the all-new 2019 Jaguar I-PACE, contact Jaguar Vancouver by phone at (604) 738-5577 or drop by the showroom at 1730 Burrard Street, Vancouver.